Nodes show people. Line weight is proportional to number of lunches. There are easier places to work than Atomic Object. We don’t specialize in one industry or technology domain, so we’re constantly learning. We push hard to build the best app possible for a given budget, and ideas always exceed budget. We all contribute to our marketing efforts through the company blog. Everyone’s expected to understand the economics of the company and make smart decisions with their time. We push ourselves constantly to develop professionally. In short, we have high expectations of ourselves and each other. So why do talented people with lots of employment choices choose to be Atoms? Daniel Pink’s three dimensions of motivation are part of the answer. We score high on mastery and autonomy, and we adopt our client’s purpose for the duration of each project. A serious commitment to sustainable pace keeps the intensity manageable. Lastly, and perhaps most importantly, we have strong bonds to each other. Those bonds were strengthened last year with an experiment I called “pair lunch”. With thirty-five employees in our Grand Rapids office we could no longer rely on the natural mixing of project starts and stops to make sure everyone worked closely together even once a year. If they don’t have projects together, I thought, let them eat lunch! The company would buy lunch for any two employees who hadn’t lunched together in the last month. You can’t ask anyone about other rules or guidelines. Trust your judgment. I encouraged everyone to use pair lunch to get to know each other as individuals, talk about non-urgent company stuff, and generally avoid making lunch a continuation of project work. Pair lunch has been very successful in making connections between people who wouldn’t otherwise have had an opportunity to get to know each other. The image above illustrates the overall success of the experiment because of the richness of the connections. 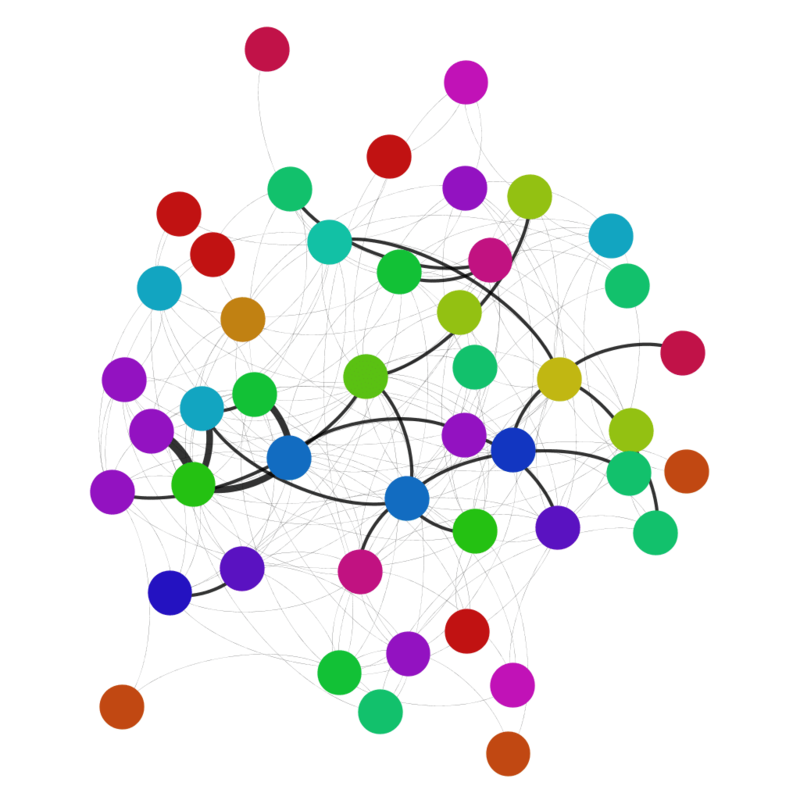 The nodes represent individuals, the lines show who had lunch with whom, and the line weight indicates how many times they had lunch. By making it a benefit, and giving it a name, people seem to feel freer to initiate lunches with no particular agenda or need to meet. This seems particularly valuable in a company with a fair number of people who aren’t naturally inclined to initiate a social event. [Pair lunch] is one of the better ideas you’ve ever had. Drew and I pair lunched today and we shared lots of good conversation about usability testing, AO culture, and many other topics. [This is] something we never would have done without the encouragement to do so. One of the things I do for new hires is to facilitate pair lunches in their first two weeks of work. I do this by asking three or four people to initiate a pair lunch with the new employee. I hope these lunches, along with our Culture Pair assignments, smoothes a new employee’s entry into the company. Having the lunch initiated by other employees (versus me arranging them) also teaches the practice. Total number of participants was 47. Total number of unique pairs having lunch was 216. The most lunches participated in by a single person was 26. The fewest lunches participated in by a single person was 2. The largest number of distinct lunch partners for a single person was 22. The number of lunches per person averaged 9.5. The maximum number of lunches for any single pair was 4. The average cost of lunch was $28. A year of lunches, $6,782. Personal connections in the company, priceless. For comparison, we spend approximately $10,000 each year on the parties that follow each company quarterly meeting. There were 242 lunches in the first year. At roughly $144 per participant per year, pair lunch is not only an inexpensive benefit, it’s helped build and maintain the personal relationships and strong bonds that keeps Atomic working. I love this idea! I just proposed it to our president and we’ll be rolling it out within the next few weeks! Thanks for sharing! That’s great to hear, Ron. I’ll be interested to hear how it works out for your company. I hope you benefit as much as we did. We rolled out pair lunches based on the AO model a few months ago and it has been working out great. Its really worked out well with mixing new employees and those that work in unrelated areas. I think it forms good communication habits between people that would normally get stuck in a silo because of specialization. So glad it helped you guys, too, Craig. Did you add any more rules around it or keep it super simple? We keep is very informal, and have had great results. There’s no one abusing the program and eating only pair lunches, for example.